You know if you have a ripe papaya if it has skin that is turning from green to yellow. If a papaya is ripe, you should be able to press your thumb into the flesh. Papayas will ripen more quickly when put in a paper bag with ethylene-producing fruits, such as apples or bananas. Papayas come in various shapes and sizes. The Hawaiian variety is smaller and pear-shaped, while the Caribbean and Asian papayas are large. All types are delicious, brimming with vitamin C, other nutrients, and antioxidants. Papaya is especially wonderful for anyone with a sensitive stomach, irritable bowel syndrome, or poor digestion. Papaya contains a special digestive enzyme called papain, which is why the fruit is revered as a powerful digestive aid. Place the papaya on a cutting board. Using a large, sharp knife, cut the papaya in half lengthwise. Open ​the halved papaya and separate it into two sections. 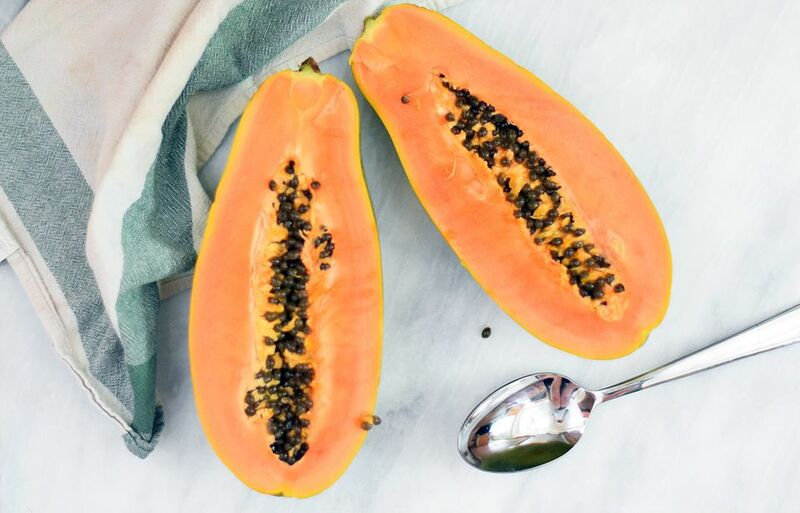 You can enjoy the papaya fruit by digging into it with a spoon. Or create papaya "melon balls" with a melon ball scoop or an ice cream scoop. There are many ways to slice, present, and prepare papaya. To peel the papaya, hold the fruit vertically and run your knife down along the skin in long slices. Again, try not to slice too deeply, or you will lose a lot of the fruit. If you are not comfortable using a knife, use a vegetable peeler to remove the skin. Alternatively, you can cut the papaya into slices and use a knife to peel the skin off each slice. Now turn the papaya over and simply slice into wedges as thick or thin as you like. Keep cutting if you want cubes of fruit. Papaya wedges are a nice option to serve for breakfast. Their vibrant, rich orange color looks great alongside a plate of eggs and toast. A preparation tip: Squeeze a little lime juice over the papaya to take away any unattractive smells and enhance the flavor of the fruit. Or combine your fresh papaya with other fruit in a fresh fruit salad.